A quadratic equation is an expression that has an x^2 term. Quadratic equations are most commonly expressed as ax^2+bx+c, where a, b and c are coefficients. Coefficients are numerical values. For example, in the expression 2x^2+3x-5, 2 is the coefficient of the x^2 term. Once you have identified the coefficients, you can use a formula to find the x-coordinate and the y-coordinate for the minimum or maximum value of the quadratic equation. Determine whether the function will have a minimum or a maximum depending on the coefficient of the x^2 term. 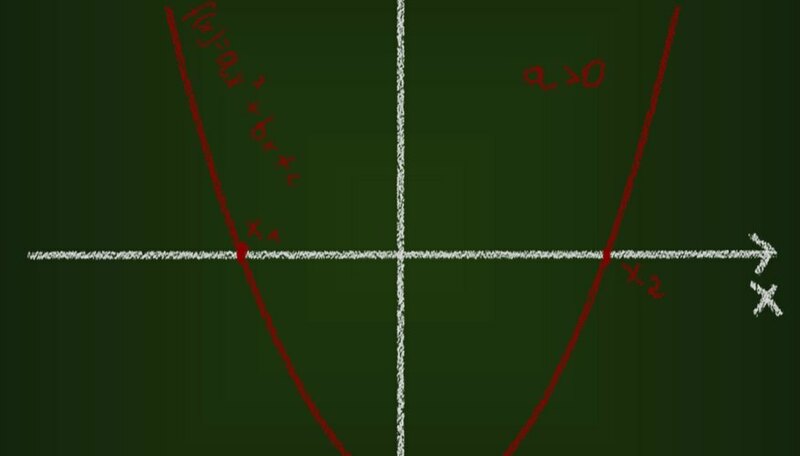 If the x^2 coefficient is positive, the function has a minimum. If it is negative, the function has a maximum. For example, if you have the function 2x^2+3x-5, the function has a minimum because the x^2 coefficient, 2, is positive. Divide the coefficient of the x term by twice the coefficient of the x^2 term. In 2x^2+3x-5, you would divide 3, the x coefficient, by 4, twice the x^2 coefficient, to get 0.75. Multiply the Step 2 result by -1 to find the x-coordinate of the minimum or maximum. In 2x^2+3x-5, you would multiply 0.75 by -1 to get -0.75 as the x-coordinate. Plug in the x-coordinate into the expression to find the y-coordinate of the minimum or maximum. You would plug -0.75 into 2x^2+3x-5 to get 2_(-0.75)^2+3_-0.75-5, which simplifies to -6.125. This means the minimum of this equation would be x=-0.75 and y=-6.125. If there is not a number before a variable, the coefficient is 1. For example, if your expression is x^2+5x+1, the x^2 coefficient is 1. Kennan, Mark. "How to Find the Minimum or Maximum in a Quadratic Equation." Sciencing, https://sciencing.com/minmax-quadratic-equation-7723159.html. 24 April 2017.